It’s 2009 and you’ve made a couple of New Year’s resolutions. And if you’re like most “resolutioners” – your number one resolution is to lose weight (myself included 🙂 ). Great — so what social media tools or communities are out there that can help us meet this goal? The Daily Plate (TDP) allows you to search more than 502,000 food items for calorie counts, total carbs, fat, and protein so you can track what you’re eating. What’s great about this search function is that when you search for a certain food, TDP also provides healthy alternatives with fewer calories and reviews made by other members. You can even log what you’ve eaten in a free food diary that you can access online, through their mobile site, or via the LiveStrong iPhone application (my favorite iPhone app) which is available for free for a limited time. Once you’ve registered at TDP, it’s easy to get started. 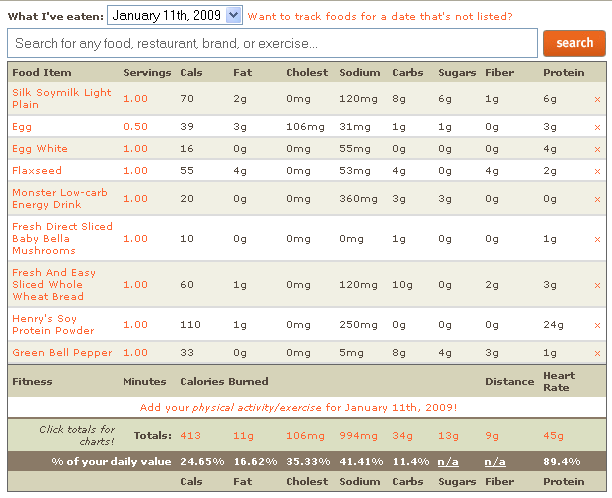 Simply type a food item in the search box and add the item to your daily plate. TDP will calculate your daily calories automatically. You can even track your daily activites (i.e. running, walk, etc.) and log the calories you burn each day. So if you’re serious about keeping your resolution to lose weight, check out The Daily Plate and see what they have to offer and don’t forget – it’s FREE. What other web 2.0 tools are you using to meet your New Year’s resolutions? Interesting. I have to check out the iPhone app. I’m scared to record all the calories I consume from just beverages during the day. @Daniel: Good catch! I didn’t see “for a limited time” on the Livestrong site but I see it now at the iTunes store. I decided that it was about time I started eating better as well…I joined sparkpeople but its hard to put everything in! @Sara: I felt that way too but once you start doing it, logging everything gets easier because your most common foods are just a click away. I don’t use Sparkpeople but if it has a “Create a New Meal” feature you can customize it for foods that you eat regularly. For example, instead of logging in all of the ingredients for my coffee separately – I make it a ‘meal’ and everything gets put in automatically. Good luck reaching your goals! I’d be happy to chat if you’d like to learn more about SparkPeople. SparkPeople is also completely free. Our iPhone app is coming soon. We love helping people reach their goals and have been continually improving the site for about 8 years now and have grown into one of the largest health-related sites because our members get great results and spread the word. We now regularly have successful members appear in media outlets like the Today Show, Good Morning America, People magazine, etc. One of my favorite parts about SparkPeople is the amazing positive support members give each other. There are over 10,000 teams members can join based on just about any affinity and millions of message board posts per month. This includes local groups that are starting to meet offline around the country to do activities together.